Located at the foot of the Black Mountains, Old Fort is a small quaint town often called the "gateway to the west." 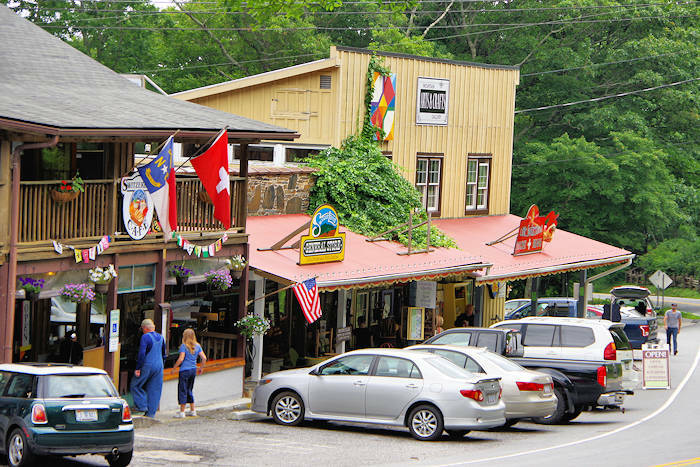 If you are traveling along Interstate 40 east toward Asheville, Old Fort is the little village near I-40 that you passed by before you drive the winding section up the ridge of the Appalachian Mountains. The town of Black Mountain is located at the top of the ridge. 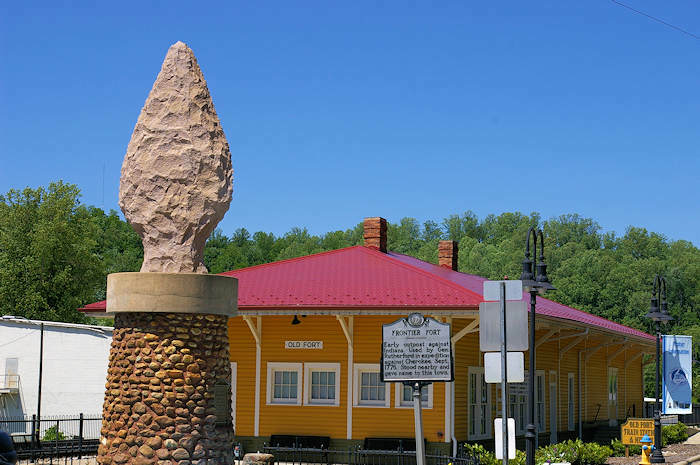 Visitor Center: Less than a half mile from I-40 at exit 73 is the McDowell County Visitor Center at 91 South Catawba Avenue. Stop there for all sorts of maps and brochures about things to do. 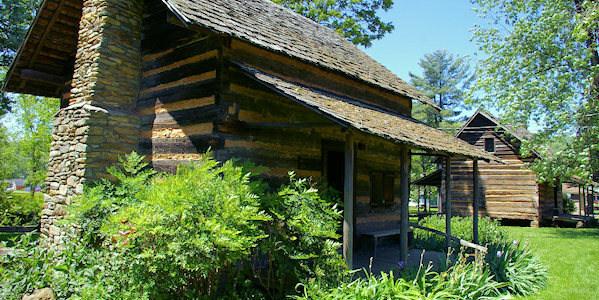 Adjacent to the Visitor Center is the Mountain Gateway Museum, the state museum exhibiting mountain lifestyle and history from the earliest inhabitants to the twentieth century. 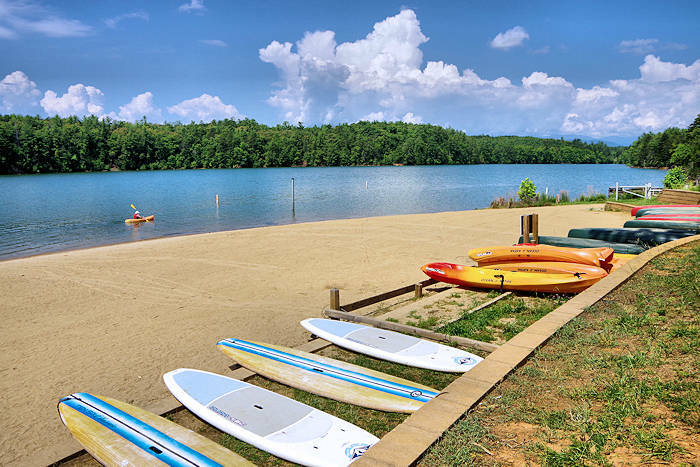 Summer music programs, festivals and a variety of other activities are held there and at their outdoor amphitheater on Mill Creek. Free. Read more. 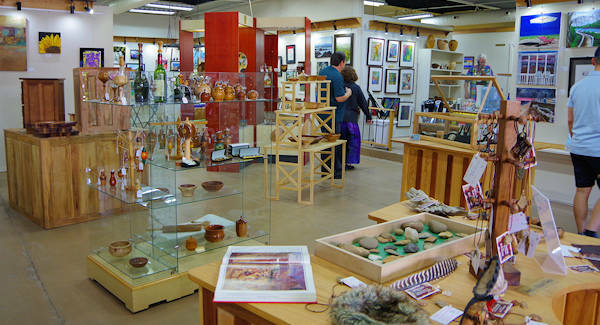 Across the street from the Visitor Center, see and buy works from 40+ artists and artisans at Arrowhead Gallery and Studios, featuring a wide variety of arts and crafts, classes and workshops. 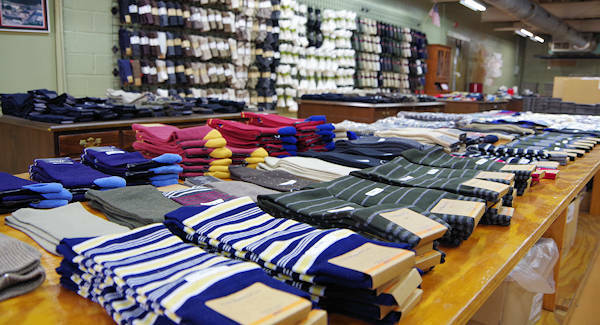 They are closed Mondays all year, plus closed Tuesdays in January-March. 78C S Catawba Avenue. 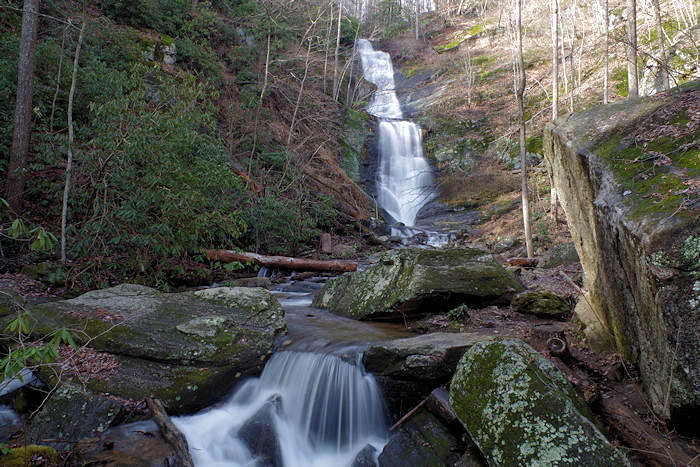 Catawba Falls is a very scenic hike along the cascading river to a 100-foot waterfall in Pisgah National Forest. The trailhead is just a few miles from downtown Old Fort, and it has received many recent improvements including a couple of footbridges. Read more. 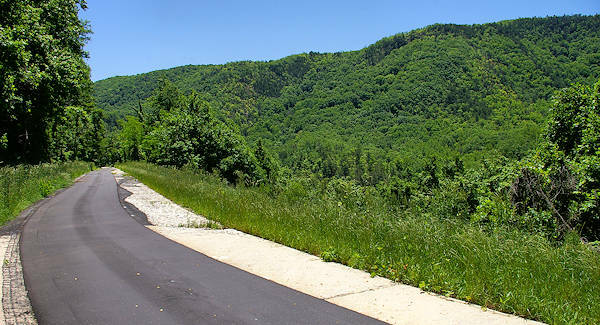 The Point Lookout Trail is a unique, paved greenway that follows a former road up the ridge, so it's a constant walk or bike ridge for 3.6 miles. 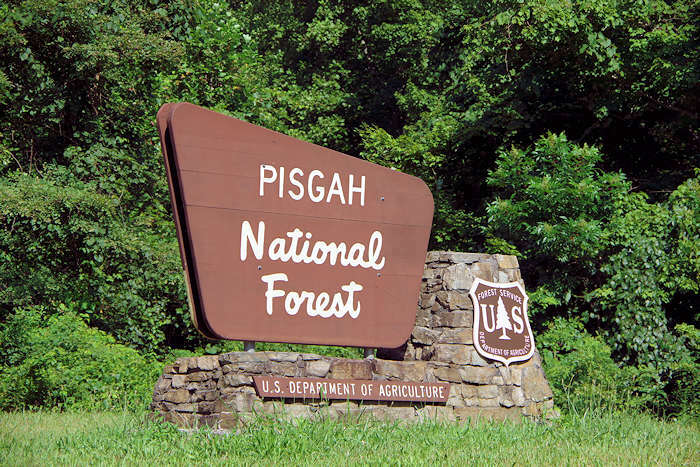 It takes you through Pisgah National Forest with mountain views along the way. Read more. 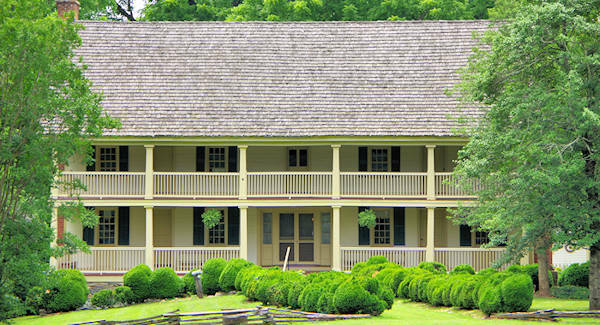 Located 9 miles east of Old Fort on US Highway 70 is the very historic Carson House. Today, it's a fascinating museum covering 200+ years of regional history. Read more. Old Fort Arrowhead Monument: In the center of Old Fort, built in 1930 this hand chiseled granite monument served to honor the peace finally achieved between the pioneer settlers and the Native Americans (pic at top of page). At the unveiling, over 6,000 people attended including chiefs from both the Catawba and Cherokee tribes. These two tribes had never smoked a pipe of peace together until that day. 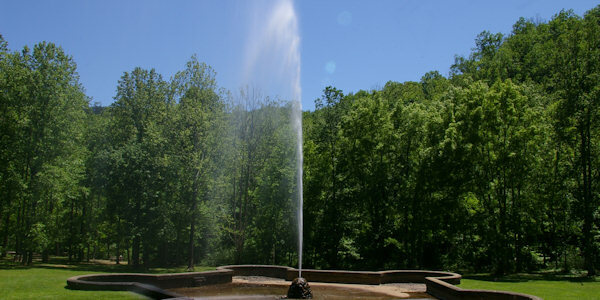 Andrews Geyser: Located just outside Old Fort in McDowell County, this manmade geyser shoots up over 80 feet high at times. Its water supply is drawn from the Mill Creek. Enjoy the mighty, misty column of mountain water that shoots straight up, twisting a bit in the wind, always raining down. Andrews Geyser is free, open to the public, and surrounded by a sizable concrete wading pool that’s a super spot to get misty. The park includes picnic tables and stone benches, where you can watch the water show. Catch a rainbow with early morning or late afternoon sun. About 5 miles west of downtown Old Fort at 2111 Mill Creek Rd. Turn left onto Main Street, then right onto Old US 70. 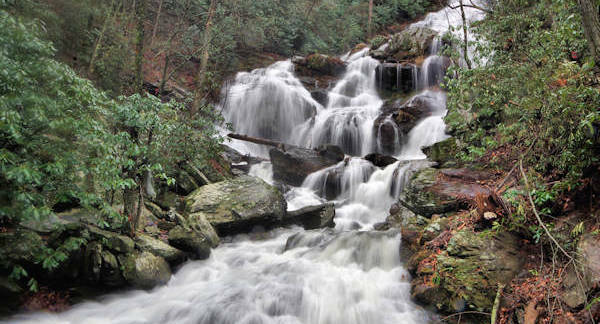 Since 1869 travelers through these mountains looked for the familiar sight of a tall water plume, a geyser, and a resort hotel tucked away at the base of the Blue Ridge this signaled the start of the long climb to Asheville through some of the most scenic terrain in North Carolina. Originally a fort built by the colonial militia before the Declaration of Independence, the settlement served for many years as the western outpost of the early United States. The fort is now being rebuilt by the non-profit corporation "Davidson's Fort Historic Park.